My latest article is up on Popmatters: Amnesia and the Topography of Fear. 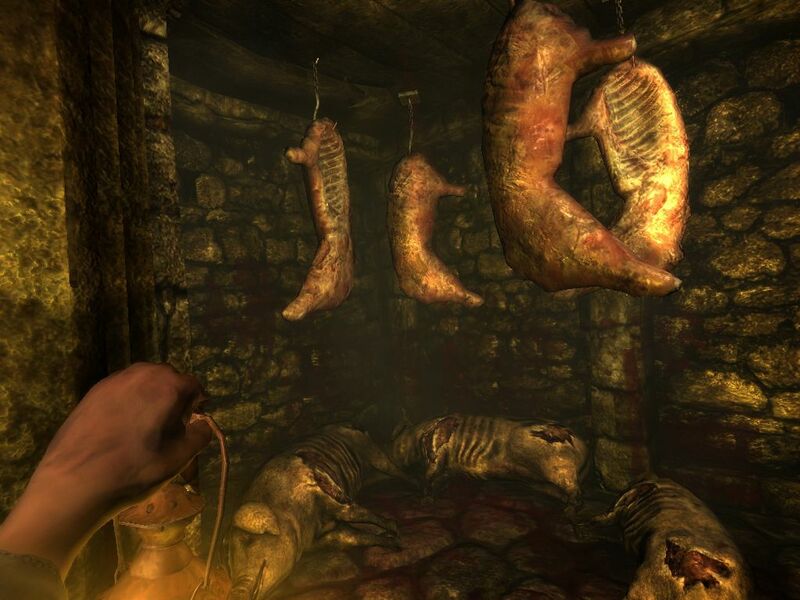 Although I generally consider myself a lightweight in the face of horror entertainment, believe me when I say Amnesia: Dark Descent is absolutely terrifying. One of the reasons I usually dislike horror, especially horror films, is that they too commonly rely on jump scares and gore. They aim to make people nervous and then nauseous. While there is certainly unsettling imagery in Amnesia, it does not induce fear with petty tricks. The mechanics and the narrative are genuinely unnerving and deeply mysterious. The game actually feels like a playable story from H.P. Lovecraft, easily one of the most skilled horror writers whom you should all promptly read - preferably under the covers, in a dimly lit room, while a storm batters your window. Lovecraft was adept at making readers feel helpless and confused. His protagonists often wrestled with insanity, making rationalism seem like a hopelessly feeble protection against an imposing force. Lovecraft thrived on the unknown, skillfully skirting around mysterious anomalies, forcing readers to imagine incomprehensible monstrosities. My playing with light and darkness, by making a player's sanity deplete while looking at monsters, by allowing players to peak around corners, Frictional Games is constructing a similarly disturbing experience. I am certain it is no coincidence the game so closely resembles Lovecraft's story The Outsider. I do not mention the sound at all in my PopMatters article, but the game's sound scape is absolutely fantastic. Mark my words, if Frictional does not win the IGF award for Excellence in Audio, I will eat my hat. Hiding in a closet, hearing the slow approach of some threatening nightmare, the creaky sound of the closet door as you peak out, checking for safety and a glint of comforting light, is enough to make you want to stop playing, go outside, and remind yourself Amnesia just a game. Regarding sound, it's made obsolete by the games musical "spider sense". When the music changes back to normal, the beast has un-spawned and the coast is clear. On the other hand, when the screeching "monster found you!!!" cue suddenly flares up for no good reason, the spider-sense does become positively panic inducing. Good call on The Outsider. It references it so closely, because the creators have said it was the basis of the game. Can't wait to play it once I have a dedicated graphics card. I like the idea of the player character trying to keep a grip on sanity throughout the game. I once played a pen and paper roleplaying game with a similar idea. 'Sanity points' could be just as appropriate as hit or stamina points in a serious horror game. It amazes me that certain game characters do stay sane in the circumstances they end up in. Mario after 25 years of pipes and mushrooms. You could write a thesis there. You are right--the sound was absolutely fantastic. What I loved about it was how unique it always felt--if there were sound tracks that were repeated I didn't notice or couldn't notice because the sound continually unnerved me. I was always hearing whimpering, whispers, crying, and rushes of wind. I don't know if any of you had this experience--but I didn't see an enemy until probably 2-3 hours into the game--but for nearly that entire time I was sure I was being followed by them. The more I lost my sanity the more it seemed I would hear footsteps and strange noises. Anyway, I couldn't agree more--the sound was superb.